Secondary brain cancers. 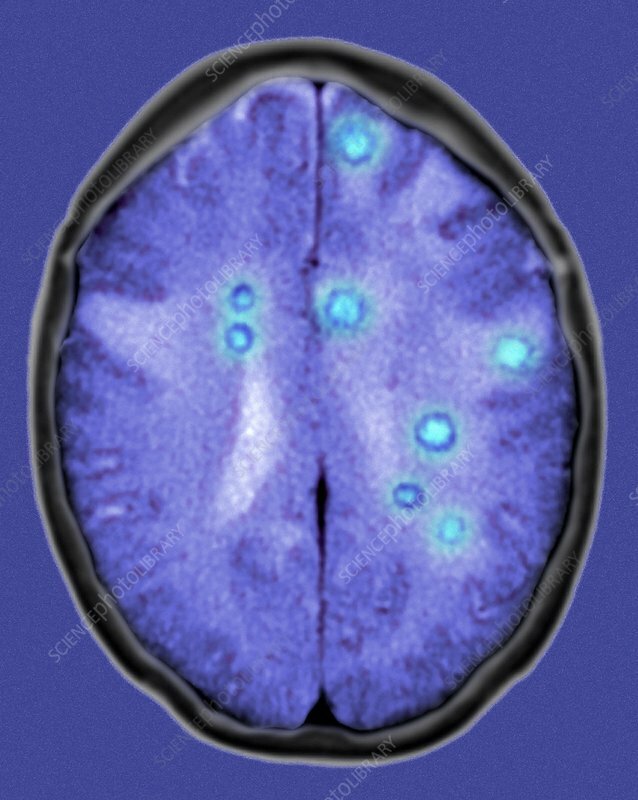 Coloured axial computed tomography (CT) scan through the head of a woman with secondary brain cancers (light blue). The front of the head is at top in this view from below. The cancers have spread (metastasized) from a primary cancer elsewhere in the body. This patient also has carcinoma of the ovary and of the gallbladder. The spread of cancer to the brain is common. A systemic (whole body) treatment, such as anti-cancer drugs, is needed, but cancers are often inoperable and fatal at this stage. CT scanning uses X-rays to produce slice images of the body.